Its streets are notoriously congested during Grand Prix weekends, but are little different at any other time of the year. Everyone seems to own an AMG Mercedes but opportunities to extend them beyond second gear are limited. The pace of everyday life in Monaco is inversely proportional to that of its biggest tourist attraction. To the south-west of the city state, the Fontvielle district – developed about 50 years ago on reclaimed bits of the Mediterranean – is slightly less hectic. 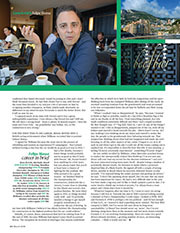 Many Formula 1 drivers have made their homes here and Felipe Massa suggests we meet at the BeefBar, located on the harbour front in the shadow of the Stade Louis II, home to Monaco FC. It’s what he has done from a very early age. “IT ALL STARTED because of my dad,” he says. “His name is Luiz Antonio, though everybody calls him ‘Titonio’. He raced touring cars for fun in Brazil and I used to watch him as a small kid. He also took me to watch F1 practice at Interlagos in 1986 or ’87. 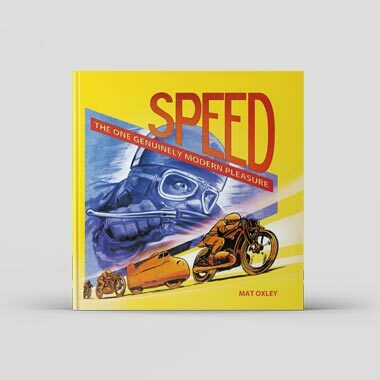 When I was about six he bought me a 50cc motocross bike and that was it – I fell completely in love with the sport and decided I wanted to be a motocross rider. After a couple of years, though, I was starting to become a bit too crazy with the bike and that was a worry for him, so he took me to a kart school in São Paulo – and as soon as I drove one I fell in love all over again: now I wanted to be a racing driver. He then bought me a kart, with which I practised for a few months before starting to race at the age of eight. He returned to karting in 1997, then undertook half a season in Formula Chevrolet the following year and did well enough to take fifth in the final standings. That led to the offer of a drive with RC Motorsport, a team that had never previously won the title, but Massa proved to be a catalyst for its first such success. “Afterwards I started looking at Europe and everybody was telling me I should go to England for the sake of my career,” he says, “but people were asking less money for a season in Italy so, purely for financial reasons, I went there instead. The going rate for a year in Formula Renault was $160,000. My father managed to find $100,000 through friends and contacts. That wasn’t enough for the season, so I signed with Cram Competition for six Italian races – plus two rounds of the European Championship, which took place on the same weekends. If I didn’t find the rest of the money, my career would probably be finished. 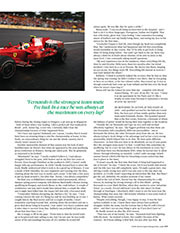 “My team-mate was Augusto Farfus and we shared a small house the team owned in Caslino d’Erba. I did three tests with the previous year’s car during the winter and broke two track records. Then at the start of the season I won the first Italian race and also the first European round I contested, so I found myself fighting for both titles even though I didn’t have the budget to challenge properly for either of them. At that stage the team started to help me. I gave them any prize money I earned and we picked up bits of help here and there, so ultimately I was able to complete both championships – and I won them. At the end of the year I received two new cars – a Renault Clio Sport for winning the Italian championship and a Laguna for the Eurocup. I gave both to the team, to cover some of what I owed. “At that stage I also began to receive interest from F1 teams – Flavio Briatore, Toyota and also Pedro Diniz, who had a stake in Prost at that time. They all wanted me to sign a contract, but Toyota was still building up its F1 operation and was offering me a deal through Prema, with whom I’d have been racing in F3 alongside Ryan Briscoe. I said, ‘Listen, if you want to sign me I want to deal directly with Toyota, not Prema.’ So that didn’t happen and they recruited Franck Perera instead. Briatore was keen for me to race for him in German F3, but at that point I had two managers – and one of them was Adriano Morini, from Draco Racing. He wanted me to drive in the Euro F3000 series – so it was in his interest that I didn’t agree to an F3 deal – and I decided to stick with him. The reason I didn’t sign for Diniz? He wanted too big a stake in my future earnings! THAT WENT WELL and, two years after arriving in Europe with enough money to do a partial Formula Renault campaign, Massa had landed his first F1 race seat without having ventured anywhere near F3 or the mainstream F3000 series. Was he ready for F1? 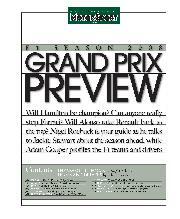 For 2004, he was back on board at Sauber. And he was also a winner before the campaign was through. While Schumacher scored seven victories and duelled with Fernando Alonso for the world title, Massa finished consistently in the top five, recorded a number of podium finishes, took his first Grand Prix win in Turkey and signed off with a dominant victory on home soil, at Interlagos. In that race, his last with Ferrari, Schumacher pitted out of sequence after sustaining front wing damage and then charged back through the field to finish fourth – a memorable sign-off. “Michael was great for me because it was a bit like having a teacher in the other car. Sometimes he didn’t want to show me things – he was similar in that way to Fernando Alonso – but I was a relative unknown, at the beginning of my career, and regarded him as the master. He was very kind to me. I’d often say to him, ‘Listen, I just want to learn from you’ – but he could sometimes be a bit awkward if I was quicker than him! That’s just Michael. The dynamic changed significantly with the arrival of Räikkönen as Schumacher’s replacement. 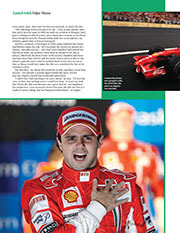 “That made life better for me,” Massa says, “because Michael had more or less owned the team! 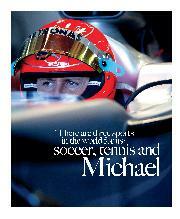 Ferrari’s first interest had always related to Michael, irrespective of whether it was the right or wrong thing to do. The team always focused on Michael, 100 per cent. When Kimi arrived, I think the mentality was that he’d be the guy – but I actually had a better first half of the championship than he did and was leading him by a point after the Turkish Grand Prix. Then we went to Monza, where he finished third and I retired with a broken damper while I was running ahead of him. The team had decided that it would put its weight behind whichever of us was ahead in the championship after Spa, where Kimi did a better job than me – he won and I was second, which put him a few points clear. After that I let him win in Brazil, to clinch the title. 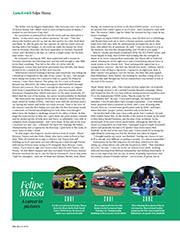 And for a moment at Interlagos in 2008, many believed that Massa had likewise taken the title. He’d recorded the victory he needed in a chaotic, rain-affected race – and rival Lewis Hamilton had started the final lap in sixth, one position lower than he needed to be. But at Junçao, effectively the final corner of the season, Hamilton had more purchase than Timo Glock’s still dry-tyred Toyota and was able to nip ahead to gain the extra point he needed [level scores were no use to him, as Massa would have taken the title on a countback by dint of six victories to five]. The Brazilian – for whom this would be an 11th, and final, Grand Prix success – was already a popular figure within the sport, but his post-race dignity earned him worldwide admiration. “I didn’t feel I had anything to be sorry about,” he says. “I’d won the race, so there was nothing more I could have done. It wasn’t my fault that I’d lost the title and that gave me a great deal of… not happiness, but satisfaction. 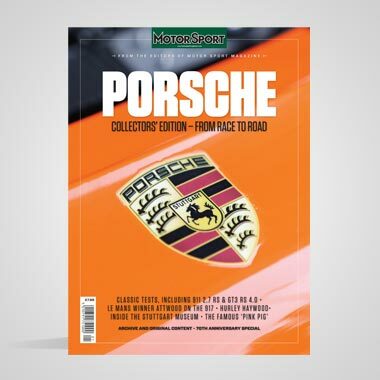 I was measured about it because the title was lost as a result of various things that had happened beforehand – an engine failure during the closing stages in Hungary, a pit mix-up in Singapore – both of them when I was leading. I did a perfect job that weekend in Brazil – pole, fastest lap, a race win. I certainly didn’t lose the championship because of what happened there. Another memorable element of that season was the look of utter bewilderment on Massa’s face when he appeared in the post-qualifying press conference at Monaco, having just taken pole. Was he genuinely as surprised as he looked? His final year as Räikkönen’s team-mate ended prematurely, when a damper spring parted company with Rubens Barrichello’s Brawn during qualifying in Hungary and struck Massa on the crash helmet. A couple of centimetres one way and it would have missed him, a couple the other and it might have killed him: the impact left him with a fractured skull. “Gradually I began to feel OK, even though my head was completely blue. 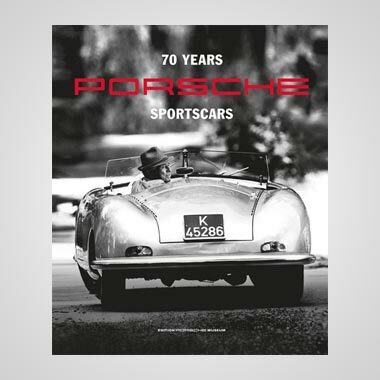 But I understood what had happened and felt that everything would normalise in due course, that I’d be able to get back to doing what I’d being doing before – but until I got back in the car there was always a little bit of doubt about whether I’d be able to drive at the same level. I was constantly asking myself questions. HE RETURNED TO action at the start of 2010 – and qualified second for the Bahrain Grand Prix, the best part of four tenths quicker than newteam-mate Fernando Alonso. The Spaniard passed him at the first corner, however, a foretaste of where the balance of power would lie during their time together at the Scuderia. And then there was Hockenheim 2010, when he moved over to allow Alonso through following an unsubtly ‘coded’ radio message [which earned Ferrari a $100,000 fine for breaching a team orders ban that was in place at the time]. “It wasn’t exactly the first time that kind of thing had happened to me at Ferrari,” he says. “I knew the score, but it was barely mid-season and the title race was still completely open. I’d made a great start, was driving a really strong race and it was one year to the day since my accident, so I really wasn’t expecting an instruction like that. But then I got the call, definitely the saddest moment of my career. He finally moved on after the 2013 season. “That was out of my hands,” he says. “Fernando had been fighting with the team – he wanted to leave, but couldn’t because of his contract. He’d been talking to Red Bull, but just after Spa they confirmed that Daniel Ricciardo would be joining in 2014 and I don’t think Fernando knew. He had little choice but to stay with Ferrari – and the team then decided to try and put a bit of pressure on him by re-signing another champion, in Kimi, which made absolutely no difference to my mind because Fernando is much the better driver. But it left no seat for me. 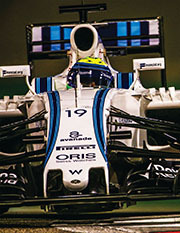 FOR THE FIRST time in his career, Massa moved into a British racing environment when Williams recruited him to partner Valtteri Bottas. 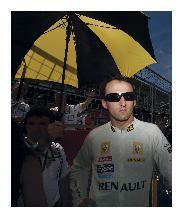 as he was accompanied down the pit lane by Raffaela and their young son Felipinho. He was swiftly recalled by Williams, when Mercedes poached Bottas to replace the unexpectedly retired Nico Rosberg (“I’m not sure any driver will ever beat my record for the shortest retirement”) and over the year outscored young team-mate Stroll – despite losing a number of potentially decent results, for instance in Spain where a puncture deprived him of a likely fourth. He signed off with a couple of strong drives, notably in Brazil where he narrowly defeated Alonso to take seventh. “I’ve enjoyed being the senior partner and passing on advice,” he says. 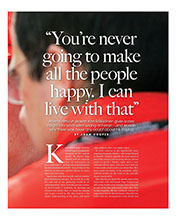 “I don’t like speaking about myself, but I’m sure that my input has been important for Lance. He had a very difficult start to the year but then made a big step and I’d like to think I played a part in that. I’ve never tried to shield any technical secrets, I’ve always been a team player and I think that’s how it should be. "Some of the diffcult times made me stronger"
"There are three sports in the world for us: soccer, tennis and Michael Schumacher!"